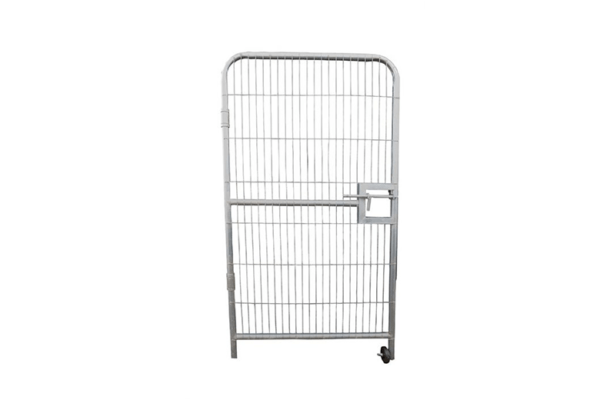 Pedestrian gate fencing hire is an additional product available in the site fencing hire range. The pedestrian gate is made from high-quality steel and has a galvanised finish which helps to prevent rust. All pedestrian gates are are supplied with a Castor Wheel and Gate Hinge. This products available from Site Equip for long term or short term projects. The anti climb pedestrian gate allows pedestrian access to secure building or construction sites. Our this has been designed to minimise accidents, reduce the risk of climbing and restrict unauthorised access. Within the hire of the pedestrian gate, Site Equip provide not only the panel but the block and security clips to accompany. If you would like additional security, double clips are available as an extra. Site Equip also offer stabilisers for the fencing for particularly winding or unstable sites. Why order your pedestrian gate fencing hire from Site Equip? Site Equip not only hire pedestrian gates but can also sell it via their sister company Site Build. We can offer ex-hire second hand equipment, pedestrian gates, stabilising blocks and security clips. All subject to availability. Site Equip can deliver and install your pedestrian gate across the South of England including; Hampshire, Surrey, Sussex, London, Berkshire, Buckinghamshire, Kent, Sussex, Oxfordshire, Wiltshire and Dorset.